I AM on Facebook with a modest number of "friends" who are mostly family members, former work colleagues and, of course, friends. I am not like all my teenage relatives who have a friends' list the size of the population of a small town. Mine is more the size of one village street. If you are on Facebook you will know that every so often it automatically generates "memories". These are old posts you can reshare if you want to. I look at all my friends' posts of birthday parties, wedding days, family get-togethers, their pets being cute or their children smiling sweetly. What do I get on mine? 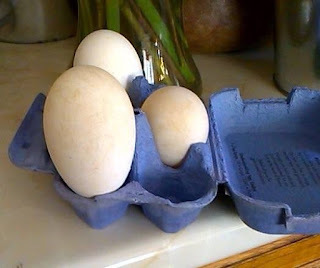 ...a picture of three sodding eggs on my mother's kitchen counter. I only posted it because I was feeling sorry for the poor chicken that laid that huge one - only to be told by Mother that it was a goose egg. She despairs of me. I was brought up on a farm but seemingly have no more knowledge of country life than a child born in an inner city high-rise.